Hospitality marketing is in a state of flux in 2018. The continued growth of online platforms, increasing ubiquity of mobile devices, and shifts in U.S. demographics are fundamentally changing how accommodations are found, researched, and booked. What does this mean for brands? How should you be reshaping your marketing strategy? Which digital tactics and channels are worth watching closely this year? To find out, we went through a host of recent research and analyst reports. To see what emerged, take a look at the overview below, as well as MDG’s new infographic, Hospitality Marketing in 2018: 5 Digital Trends to Watch. It’s no surprise that hospitality consumers have moved online, but it’s worth highlighting the incredible scope of this shift. Put simply, digital is now the foundation of the travel experience. Consumers have come to rely on digital channels throughout the travel purchase funnel. Consumers aren’t just utilizing a single site or app, they’re going broad and deep online. Not surprisingly, hospitality and travel advertising dollars are following consumer behavior. For brands, this means that hospitality marketing is now intertwined with digital marketing. It’s become impossible to consistently succeed without a sophisticated online strategy. 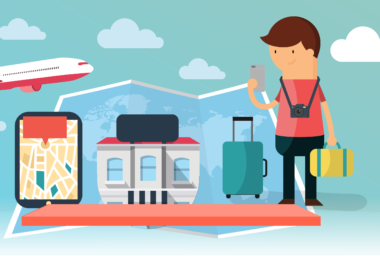 As search engines such as Google and Bing integrate additional travel information and tools, they’re becoming ever more important to consumers. While search engines are utilized across all generations, they’ve become especially important to younger consumers. For younger hospitality consumers, search engines are now often the starting point for booking. The importance of search for travel brands extends to both unpaid and paid tactics. Search ads have become highly effective in reaching consumers, especially younger ones. The reliance on search by travelers means that hospitality brands—especially those targeting younger consumers—need to think hard about both their SEO and SEM strategies this year. Consumers’ increasing reliance on smartphones is impacting every business vertical, from retail to communications. This is no different in the travel and hospitality space. Although smartphones are increasingly used at the beginning and end of the travel journey, desktop computers remain more popular in the middle stages. While consumers overall remain reliant on desktop computers, younger travelers are more open to using smartphones throughout the process. What’s a hospitality marketer to make of all this? The big takeaway is that for now you should take into account both mobile and desktop behavior—but plan for a smartphone-first future. The very nature of travel and hospitality has always lent itself well to visual pieces. As online platforms become more image and video focused, this type of content is increasingly effective. When planning trips, many consumers now consume multiple types of content across channels. The effectiveness of visual content applies to paid units as well as organic pieces. Consumers cite visuals as the most memorable elements of digital travel advertising, ahead of specific deals/offers and personalization elements. For hospitality brands, consumers’ preference for images and video means the ROI on these pieces is often impressive. Investing more resources in visuals can have a big payoff over time. Members of loyalty programs are extraordinarily valuable for hospitality marketers. These consumers are already familiar with your brand and are predisposed to visit your property. Members of loyalty programs are more open than non-members to digital messaging and online personalization from brands. However, loyalty reward membership doesn’t mean that a consumer is blindly loyal. Even elite members of loyalty programs don’t automatically book with properties. Travel loyalty members will only stay loyal if they think they’re getting a deal from the program. Fundamentally, consumers favor hospitality brands that offer real value and take their content, device, and travel preferences into account. Digital marketers who understand these ever-shifting behaviors are the best poised for success this year and beyond. To find out more, check out our full infographic, Hospitality Marketing in 2018: 5 Digital Trends to Watch. Learn more about the latest hospitality marketing trends. Contact MDG Advertising today at 561-338-7797 or visit mdgadvertising.com. This post is an update of an article from 2012. You can read the full original article below. In 2012, the luxury consumer is looking to be entertained, engaged, and to experience exciting new things. To help marketers appeal to this discriminating clientele, KWE Partners compiled a list of leading trends in the luxury lifestyle and travel market for 2012. 1. A New Luxury Language – While terms such as “authentic," “heirloom,” and “artisanal” defined 2011, the new year will bring new terminology that will resonate with luxury consumers. These new words will include “rare” and “precious,” which are more evocative and provide more precise descriptions of their offerings. If possible, marketers should try to tell their brand story with images and avoid flowery adjectives altogether. 2. Value via Fun – Value became an essential status symbol in 2011, and that quest for a good deal will continue in 2012 but with the purpose of amusement, in addition to savings. Savvy marketers will design promotions around games and searches that will entertain affluents on their hunt for value. These “gamification” strategies will be among the top trends in world travel. 3. Content Marketing Strategy – Rather than just promoting products and services, marketers will need to develop well-defined strategies that deliver consistent content through engaging information and valuable rewards. Ideas include providing insider access to special content, planning exclusive online events, asking for feedback through posts and comments, and creating rewards for social media participation. 4. Catering to Micro-Niche Lifestyle Segments – In 2012, hotels and travel venues will want to distinguish their offerings by providing specialized experiences to more targeted markets. This will create the impression of value and “something new” for consumers to discover and enjoy. This strategy of creating unique experiences for special-interest groups will also enable the re-emergence of traditional retail shopping because it will offer unique experiences that consumers can’t get online. 5. Flexibility is Key – Luxury brands will need to be more adaptable to consumers’ specialized needs and redefine their offerings to suit their current interests. Promotions and products should continually evolve with the market’s desires, as well as partner with complementary companies that can enhance their particular brand experiences. 6. More Integrated Marketing – 2012 will bring the blurring of marketing functions as social media, public relations, advertising, and e-commerce are combined to create entirely new offerings and new jobs to manage these communal strategies. Companies will need to hire marketing people who are versatile enough to perform numerous tasks, including blog writing, social media management, and integrated strategy development . 7. The Rise of Renting – Luxury consumers want all of the pleasure with less of the financial commitment, so 2012 will see new opportunities for consumers to rent and share everything from vacation homes to fashion and cars. While the practice of timeshares isn’t new, this concept will evolve to become more customized to consumers’ specialized interests. 8. Small Luxuries for Less – Indulgence can be expensive, yet luxury consumers still want to be pampered but now for a lower price. The result is luxury brands offering mini-indulgences that provide a condensed version of full-scale luxury. Some examples include upscale hotels offering rooms by the hour or day, as well as high-end spas featuring a variety of reduced treatments, and airlines creating special “VIP value packages” that deliver first-class service at an affordable price. As you can see, 2012 holds many exciting changes for the luxury lifestyle and travel industry. Marketers must develop strategies that will meet these new consumer expectations and provide experiences that will keep consumers engaged. To learn the latest strategies for marketing your luxury travel brand, contact MDG Advertising today at 561-338-7797 or visit mdgadvertising.com. MDG Advertising, a full-service Florida advertising agency with offices in Boca Raton and New York, NY, specializes in developing targeted Internet marketing solutions, exceptional creative executions and solid branding and media buying strategies that give luxury brands a competitive advantage. Our core capabilities include print advertising, branding, logo design, creative, digital marketing, media planning and buying, TV and radio advertising, customer relationship management, inbound marketing programs, public relations, Web design and development, email marketing, social media marketing and SEO. View MDG Advertising's creative marketing portfolio.